I thrive on routine sprinkled with the unknown. I’m drawn to activities that make sense to me – they have a purpose – but also those that challenge and inspire me. That’s why I’m a modern quilter. It’s also why I’m a runner. I’m not sure exactly why it surprises me, but I’m always pleased when I come across a quilter and a runner in real life or online. It’s validation that a person can be inspired by a variety of activities that may or may not make sense when put together. But to me, quilting and running are the perfect match. Quilting has an order. There’s a standard process you typically go through. You select your pattern. You cut your fabric. You sew it all back together. There’s a standard process you typically go through to train for a race too. You select your distance. You follow your training plan. You run your race. See, routine! I’ve been running a bit longer than quilting, although I didn’t start either until I was an adult. I’ve run 18 half marathons, countless 10ks, 5ks and orienteering races, as well as mountain bike races and a handful of adventure races. Running is my favorite though. There’s something cathartic about running to me. I enjoy that it’s an individual sport, although my husband and I have participated in lots of adventure races together and I always enjoy them too. When I run, even if I’m pushing a stroller or running alongside someone, it’s all about my thoughts, my purpose, my drive and my goal. It’s extremely effective therapy for me too. The same is true for quilting. When I quilt, it’s my time to be adventurous, creative, focused and driven. Ultimately I’m working toward achieving my quilting goals! And like I said, it’s also an effective therapy for me! I love that both allow me to reach and breakthrough my limits. Both push me to test the waters, even when it feels easier to play it safe. Both fill me with a sense of accomplishment. While they may not feel like complementary activities, one pushes me to get outside (I don’t need much pushing – I love the outdoors! ), while the other is a great retreat inside. I problem-solve one activity while doing the other. By that I mean I think about new patterns to design while I’m running, and I envision my race and think about my strategy while sewing. And just when I don’t think I can take another minute of one activity, I can fall back on the other one for a while. I’m fortunate enough to have discovered both of these passions. Every day I discover a new parallel between them and that drives me to excel in both. 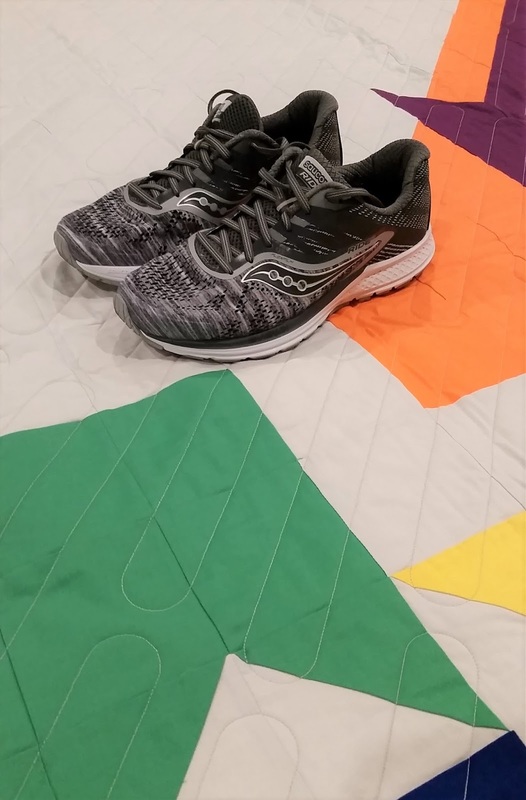 So whether you catch me running 13.1 miles or stitching 13.1 yards, I’m all in with quilting and running! What activities do you enjoy in addition to quilting? This is a great post! I’m a quilter and a wannabe runner so I enjoyed your thoughts a lot. Thanks for sharing them.